Starring: Asa Butterfield, Britt Robertson, Gary Oldman, Carla Gugino, BD Wong, Janet Montgomery, Peter Chelsom, and more. 1) Acting - Total Thumbs Up: Asa Butterfield does a marvelous job as Gardner. His wonder at seeing what Earth has to offer is infectious. Britt Robertson as the thick skinned Tulsa was perfect. It was fun watching her well placed and shored up emotional walls slowly come tumbling down. Gary Oldman as Nathaniel Shepherd was poignant as a man who'd lost sight of what the dream was about. Carla Gugino gave depth to the awakening of Kendra Wyndham's feelings and realizations about her charge. 2) Special Effects - Total Thumbs Up: The film begins before Gardner is born, so we see the actual launch of the mission to Mars. The take off sequence looked great. The views of Mars and later Earth from orbit were fantastic. Since the story is set several years in our future, there were lots of little technical upgrades to everyday life. The crystal/glass computers looked super cool. Centaur, the robot on Mars, looked like something a kid would make. The kick me sign on the back of his head was hilarious and also reminiscent of the cool SF film called "Moon." 3) Plot/Story - Neutral: This is one of those films where you don't want to look too closely at what is being told, or it starts falling apart. Overall, the concept is fun and entertaining, and it even has a couple of twists. The growing relationship between Gardner and Tulsa and their trials are what keeps us interested. Yet the film also took a few corners by omission and some of the science is ignored, so they don't have to figure out a way to work around it. 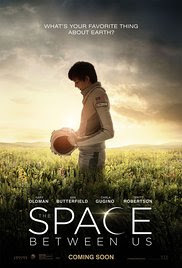 The primary driver of the film is how Gardner can't handle Earth gravity. And they did take the time to introduce a way to help his bones stand up to the higher gravity, which was great. What they ignored is the fact that going into orbit or into space, multiplies the gravity, which would, in turn, kill Gardner outright. They could have used a gel container or even a water tank to help offset some of the effects, but they didn't use anything at all. A couple of more nitpicks. 1 - Things Gardner found unfamiliar didn't quite work. Since he had access to entertainment on Mars, it's hard to believe he didn't know what streets were, or horses, even dogs. It would have been more fun for him to know what they were but touching them, smelling them, that part that would have been new and would surprise him. Much like the fun scene at the bus stop in the rain. He knew what it was, but actually experiencing it was something else altogether. We needed more of that! 2 - If Gardner had access to social media/chat rooms - why was Tulsa his only friend? 3 - Communications between Earth and Mars were pretty much instantaneous. Yet nothing was said about how this is possible. Especially since lag times currently run from four to twenty minutes each way! 4) Cinematography - Total Thumbs Up: The cinematography on this film was fantastic. The shots are themselves a love story of sorts. One to get the audience to see and fall in love with our planet as much as Gardner does. So many gorgeous shots! Conclusion: An adorable love story with bits of mystery carried forward by a great cast. As long as you don't look too closely at the details and science, you're in for a nice ride.